Description: In an unusual move, a Santa Fe GP50/40X/50 combination helps SPs BKDOL oil train up the grade at the Cable crossover. ATSF 3822 later became BNSF 3175. Date of photo approximate. Description: Thes were taken around Argentine Yard. Description: Four GP50s hustle a westbound Santa Fe pig train through Daggett. ATSF 3822 was later BNSF 3175. Date of photo approximate. Description: Westbound manifest drops downgrade on the mainline at Woodford. ATSF 3822 was later BNSF 3175. Date of photo approximate. 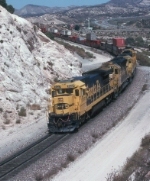 Description: A pair of warbonnets leads a BN unit and an old scheme Santa Fe unit west. The merger was only a few months old at this point, and the power had largely not mixed yet, so the BN unit was unusual. Description: ATSF 3822 leads a westbound BNSF freight which is part of an endless parade enjoyed by many on this day. Description: ATSF 3822 leads a westbound BNSF freight on the Chicago Subdivision.